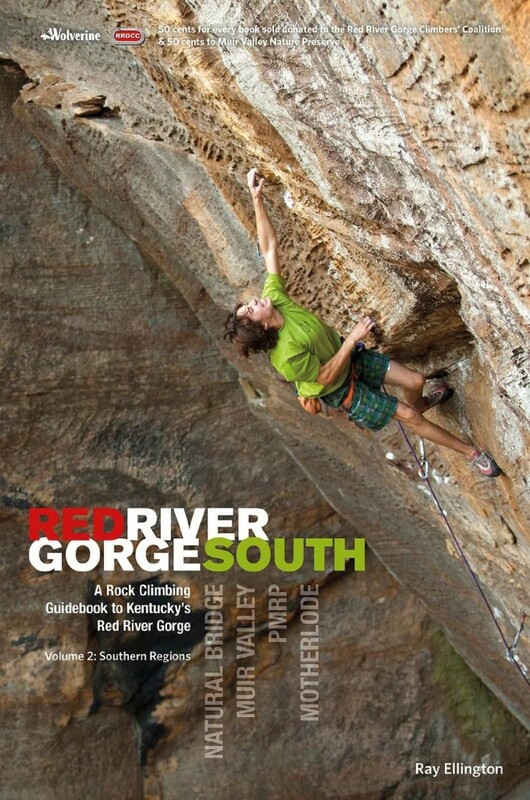 Red River Gorge South by Ray Ellington is only current guide to rock climbing routes at Kentucky’s Red River Gorge. There is also a North version of the book. Make sure that you have the correct book for the areas you want to climb. South covers Natural Bridge, Muir Valley, Pendergrass-Murray Recreational Preserve, and Motherlode. North covers Gray’s Branch, Lower Gorge, Northern Gorge, Middle Gorge, Middle Gorge, Eastern Gorge, and Tunnel Ridge Road. Red River Gorge South is organized first into area (Natural Bridge, Muir Valley, Pendergrass-Murray Recreational Preserve, and Motherlode) and then into crag within each climbing area. Within each crag each route is listed. One great part about Red River Gorge South is that each area’s section starts with a table showing some important characteristics of each crag in the area, including whether it is kid friendly, whether it is a good place to climb in the rain, how much sun it gets, drive time from Miguel’s Pizza, hike time from the trailhead, number of routes, grade range, and classic routes. Of this information, the grade range chart is the most helpful. It’s great to be able to look at the chart and see how many of each route there is at a glance. For example, Bruise Brothers Wall at Muir Valley has two 5.6 trad routes, three 5.7 trad routes, two 5.7 sport routes, etc. This whole system makes it very easy to decide which area and crag to climb in when you don’t have time to explore them all. Every route is described by number, name, rating, number of stars to indicate quality, height, number of bolts (sport routes), name of the first ascentionist and a brief description. The descriptions are not only helpful but many are entertaining to read with little pieces of history about route development or first ascent. For example, Thanatopsis at The Motherlode: 26 Thanatopsis 5.14a ***** Move right from Techno Destructo about 100 feet to a sandy ledge. This route is the first encountered on an obvious, steep, blank looking face and is stout for the given grade. The first ascentionist, Dave Hume, spent two or three years trying this route. Shortly after he succeeded he did Just Do It (5.14c) at Smith Rock in a mere four tries. 60 ft. 6 bolts. FA Dave Hume, 1996.
Who Needs Red River Gorge South? This guidebook is a little less critical than some guidebooks for other areas. Red River Gorge is well documented compared to some other climbing areas. That said, this is a well-organized book with a lot of useful information, especially if you are looking for something to climb on a busy day in the Gorge. Red River Gorge South was extremely helpful during my first trip to RRG. It’s available locally at Miguel’s Pizza, and also from Amazon . Unfortunately, there is a problem with this guidebook. It doesn’t include all of the routes. For example, the Muir Valley section includes Practice Wall but doesn’t include Guide Wall. Since Guide Wall is practically an extension of Practice Wall and has some additional easy routes that would be really helpful on busy days, this omission is a glaring problem in an area that gets as busy as RRG does. Showing all of the available routes would help to distribute climbers more evenly throughout the area and help climbers find routes that work for them. Hopefully more routes will be included in the fifth edition.